The problem with a rebuild is that it is always darkest before the dawn, and teams never know when the light finally will emerge. It’s dark for the Phillies right now, about as dark as it gets. The Phils, losers of 39 of their past 51 games, are on pace to finish 52-110. If it’s the No. 1 draft pick their fans want – for, ahem, the second time in three years – here’s the good news: The team’s lead over the Giants in the “race” for the worst record in the majors is 2½ games. 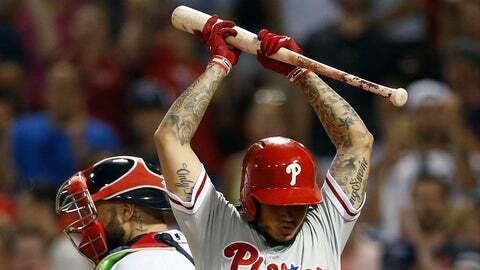 But I’m guessing that Phillies’ fans, accustomed as they might be to the tanking of the NBA’s 76ers, are not all that enthused by the daily stumbles of the local nine. And I’m guessing that no matter how much the front office preaches patience, a major acquisition or two might be necessary to satisfy the masses, sooner rather than later. Yet, this is the path the Phillies have chosen — and frankly, the only path they could have chosen after their run of five straight postseason appearances disintegrated into an unwieldy, expensive mess. At the moment, the Phils are not much different than the 2011 to ’14 Astros, who averaged 104 losses, or the 2010 to ’14 Cubs, who averaged 93. And frankly, no one should expect general manager Matt Klentak to be working miracles, not when he is in only his second year. As the Cubs, Astros and others have shown, these things take time. Still, I’ll say the same thing about the Phillies that I’ve said about the Braves, about the Padres, about every rebuilding club: The front office had better be able to evaluate. Otherwise, the Phillies will face a long-term problem, and not simply short-term pain. For now, the team’s rebuilding plan is impossible to judge. Many of the Phillies’ current players are unlikely to be members of their next championship team. Many of their top prospects might not be, either. Some will be busts. Some will be traded. Others who are not even on the current radar — who, in fact, might still be in high school or college — will emerge. Does it matter if the Phillies win 55 games this season, 65 or 75? Not particularly. But in the meantime, the Phils will hear the same questions that all rebuilding teams do — questions about process, questions about direction, questions about decision-making. Questions that will remain fair as long as their losing continues and the turnaround remains incomplete. Two more years of losing followed before the Cubs reached the NLCS in’15 and won the World Series in ’16 — and now, of course, Epstein is being feted as the greatest leader in history of man, or at least since Alexander the Great. Well, not all successful GMs had prior experience running a department, and Luhnow, in particular, is nothing if not reliant on analytics. This is what Phillies ownership wanted, a departure from the old-school tendencies of Ruben Amaro Jr. We’ll know soon enough if Klentak has enough baseball feel and knowledge. 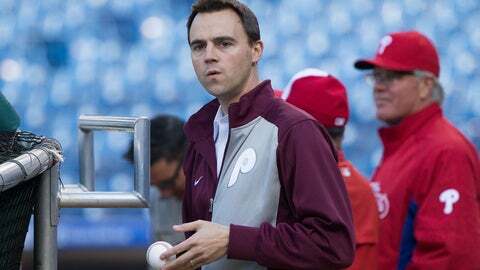 Many of the Phillies’ players and prospects are holdovers from the Amaro regime. Klentak spent nearly $65 million on patchwork veterans in his first offseason, with predictably mixed results. The bigger decisions are coming — decisions on prospects, current players, and future free agents. 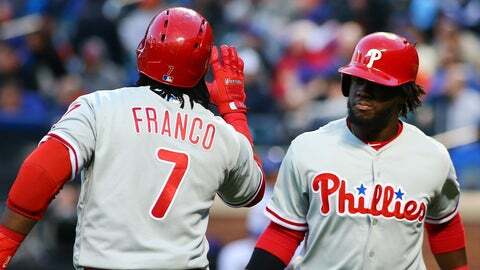 Already, the Phils are discovering that third baseman Maikel Franco and center fielder Odubel Herrera are more complementary players than building blocks. Klentak awarded Herrera a five-year, $30.5 million extension in the offseason, and perhaps the GM should have waited, keeping the carrot in front of the player. But Klentak, like many execs, could not resist a deal with two bargain club options — at $11.5 million for 2022 and $12.5 million for ’23. And the deal will not suffocate the Phillies even if Herrera, who rates well defensively, remains an inconsistent offensive player. The farm system, ranked the sixth-best in the majors by Baseball America entering the season, is deeper in position prospects than pitchers. The trick for the Phillies, as for any team, will be determining which are keepers, and which are not. Take shortstop J.P. Crawford, who is considered the Phils’ top prospect, or at least one of them. A number of evaluators are down on him, contending he will not be an impact player; he has batted .225 with a .614 OPS in 639 career plate appearances at Triple-A. But Crawford fits the profile of a Klentak player with the way he controls the strike zone. And, at 22, Crawford still might get stronger. Outfielder Nick Williams, 23, and catcher Jorge Alfaro, 24, lack Crawford’s plate discipline; Williams has drawn 10 walks at Triple-A this season, Alfaro eight. But the Orioles’ Adam Jones, who rarely walks, is an example of the kind of player Williams might become. Alfaro, meanwhile, has monster power and a monster arm; he has dealt with injuries throughout his minor-league career, and some scouts believe that he simply needs more time to develop. Triple-A first baseman Rhys Hoskins, 24, and Double-A second baseman Scott Kingery, 23, are perhaps the surest things in the Phillies’ estimation; one rival scout pays Kingery the highest compliment, calling him a “Pedroia type.” The same scout also likes Triple-A right fielder Dylan Cozens, calling him a high-risk, high-reward type who could be another Dave Parker if he hits; another evaluator compares the 6-foot-6 Cozens to Adam Dunn. Those are just some of the names, on top of outfielder Mickey Moniak, whom the Phillies selected out of high school with the No. 1 overall pick in 2016, and University of Virginia outfielder Adam Haseley, whom the team grabbed at No. 8 overall in the most recent amateur draft. Again, some will turn out the way the Phils envision; others won’t, and might be more useful as trade bait. It’s up to Klentak and his staff to make the right choices, particularly given the Phillies’ pitching needs. None of their young major-league starters appears to be top-of-the-rotation material, and most of their better prospects are in the low minors. Of course, the Astros’ Dallas Keuchel did not succeed immediately, and the Cubs built their rotation by making shrewd trades for Jake Arrieta and Kyle Hendricks, then signing Jon Lester and John Lackey as free agents. The Phillies have incredible financial flexibility; Herrera, at $3.35 million, is their only commitment for 2018. Klentak’s options include trading for big contracts, signing an impact free agent or two this winter, then going nuts for the great class of 2018-19. It’s dark right now, about as dark as it gets, but the pattern of these rebuilds no longer is unfamiliar. Patience is warranted. Patience is required. But the Phillies will need to evaluate properly if they want to see the light.